The first half of this paper provides insight into the work and the process of its composition, while the performer’s commentary presents an account of the practical and interpretative challenges presented by this compositional approach which, owing to its unique relationship to time, has been called ‘temporalism’. Therewere about a dozen watches in the window, a dozen different hours and each with the same assertive and contradictory assurance that mine had, without any hands at all. Contradicting one another. I could hear mine, ticking away inside my pocket, even though nobody could see it, even though it could tell nothing if anyone could. And so I told myself to take that one. Because Father said clocks slay time. He said time is dead as long as it is being clicked off by little wheels; only when the clock stops does time come to life. Music notation is a visualisation of time, and so the ability to shape and manipulate time becomes central to a composer. Attempting to notate musical ideas clearly involves finding the intersection between ‘heard time’ and ‘notated time’. Indeed, this is also a central preoccupation of performers, many of whom (including the Kreutzer Quartet) observe that the disposition of the notes on the page affects their phrasing; gestures can suggest their own elongation in time by the size and style of handwriting or engraving. I began working with microtiming as a compositional material in February 2009. Fundamentally, this technique involves measuring, in milliseconds, the interonset intervals (IOI) between all sound events in a given recording; IOIs can be understood as the time between the beginnings of successive sound events, or notes. It also involves measuring, in decibels, the sound energy during any moment in the life of a given sound (attack-point, decay). Translating these time and volume measurements into standard notation produces a transcription of the recording, which can then be used (in a variety of ways) as the basis for a newly composed work. At the outset, it took some weeks for me to digest the newness of seeing performed gestures superimposed across a metre. Firstly, there is the practical act of properly transcribing the measurements, which involves determining time ratios, metres and subdivisions. While this act might seem to be a kind of busywork, it profoundly shapes the resulting piece and represents an integral part of the aesthetic decision-making. Secondly, there is a more philosophical component which involved acclimatising, to composing with, against, above, below and ‘in the presence of’ the time proportions of an earlier performance. The Kreutzer Quartet state that this acclimatisation process also occurs for those who perform these pieces. Across all of my compositions, Flutter echoes, and its immediate predecessor, Étude d’un prélude I - Chopin desséché, are exceptions, in the sense that they re-express all of Chopin’s pitches in Argerich’s rhythms. They likely represent my own ‘coping’ with this new type of material, and are effectively ‘rhythmic experiments’. From my perspective they feel hardly like my work at all, and I said as much to the pianist Mark Knoop when I presented him with Chopin desséché in summer 2009 (Knoop respectfully disagreed with me). 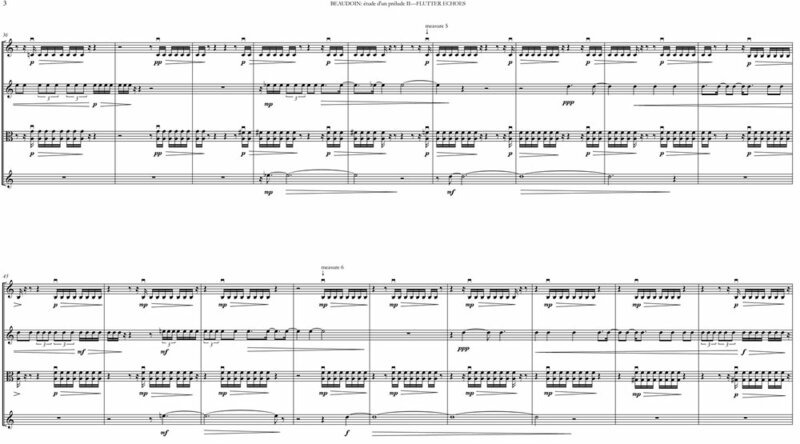 These two pieces are the first and second works in the series called Études d’un prélude, twelve of which were composed in 2009-10; the rest of the works in the series significantly alter, comment on, and re-fashion the source material. It could be said that Flutter echoes was born without my knowledge, at the Hochschule Luzern in Switzerland in 2008. There, the Swiss researchers Dr Olivier Senn, Lorenz Kilchenmann, and Dr Marc-Antoine Camp used their recently completed software project, the Lucerne Audio Recording Analyser [LARA], to prepare a complete micro-temporal analysis of Argerich’s Deutsche Grammophon recording of Chopin’s Prelude in E minor, Op. 28, no. 4, recorded in Munich on 22-25 October 1975, and released on DG 415 836-2. Their analysis was very precise: both the onset time (i.e. the moment of attack) for each note or chord captured by the microphones and the IOI between all sounding onsets was charted at the level of the millisecond. Senn, Kilchenmann & Camp (2009) includes a summary of their methodology and a visual representation of the Chopin/Argerich data in so-called ‘nested-squares-diagrams’. In February 2009, after meeting Senn at Harvard, I began pioneering a process whereby such millisecond-level microtimings could be translated back into standard notation. At first, this seemed to require elongation, to allow some equation between the enormous number of milliseconds in Argerich’s 1’51” recording and the number of useful subdivisions available in a given metre and tempo in standard notation. I have written my own accounts of this methodology (Beaudoin, 2009 and 2010; Beaudoin and Kania, 2012; Beaudoin and Trottier, 2012), and so will not recount it in full here. As mentioned, Études d’un prélude I & II (that is, Chopin desséché and Flutter echoes) represent somewhat unmediated re-expressions of the Argerich performance. As such, they are not very interesting to me as original compositions, and I feel that Études d’un prélude III-XII, as well as more recent works - based on Pollini playing Webern, Cortot playing Debussy and Thelonious Monk improvising are much more mature and engaging in their uses of this material. However, the relative purity of Flutter echoes makes it a useful introduction to the material, and an excellent vantage point from which to discuss the notions of time that I take up in all of these works. Flutter echoes is comprised essentially of two materials, which are analogous to the two materials in Chopin’s prelude and, by extension, in Argerich’s performance: a linear melody and chordal accompaniment. Whereas Chopin’s chords occur on every quaver in 21 out of the prelude’s 25 common-time bars, the accompaniment in the 222 common-time bars of Flutter echoes varies for each bar; its placement occurs in strict adherence to the proportions of Argerich’s placement, in time, of Chopin’s left hand chords in her 1975 recording. However, in Flutter echoes each of Chopin’s chords is re-expressed as a ‘flutter echo’ - here given as eight semi-quavers which decrescendo into niente. Therein lies the source of the title of the work: a ‘flutter echo’ is a name given to the acoustic phenomenon comprising a rapid series of echoes originating in reflection between two parallel surfaces. Appendix A reproduces the first three pages of the score and reveals the flutter echo material in the first violin and viola; this excerpt corresponds to the anacrusis and first five bars of Chopin’s E minor prelude, here transposed into A minor. The higher transposition was a practical decision, owing to the fact that the original key sits too low for the quartet. In addition to being playable, the move up to A minor was low enough to preserve the melancholy atmosphere and neutral enough (tonally) to rhyme with the original key. The exquisite singing melody of the Chopin/Argerich original has long elements (including numerous dotted minims) that become rather desolate in extreme elongation. In Flutter echoes, each melodic note is ‘activated’ using a combination of timbral and rhythmic techniques, employed in combination, and with some freedom. Appendix A illustrates one such treatment, occurring between the second violin and violoncello. The downbeat of bar 4 in Flutter echoes corresponds to the downbeat of bar 1 in the Chopin prelude. The downbeat note, originally struck once by Argerich, is expanded in Flutter echoes into a gesture that begins with the violoncello attacking the pitch and dying away across three and a half bars; during the decay, the second violin arrives imperceptibly on the same pitch and, with a crescendo, activates this pitch using an accelerating rhythmic pattern that extends to the downbeat of bar 9, where it falls into semi-quaver lockstep with the flutter echo pulsation of the accompaniment. Such merging and emerging between the two instrumental pairs, as well as between the melody and accompaniment strata, is a prominent feature of the work. Of course, not every note of the Chopin/Argerich material is treated in the same fashion as this opening gesture. There are moments, such as the prelude’s stretto or the closing cadence, which prompted alternative musical responses within Flutter echoes. The dynamic content of Flutter echoes is also derived strictly from Argerich’s 1975 recording. Senn used LARA to aid him in measuring the sound-energy (or volume, in decibels) at the moment of onset for every note in the performance. I then translated this information into a scale of dynamics from ppp to fff. Therefore, each flutter echo (and indeed, each initial melodic attack) is given with its dynamic proportional to Argerich’s recording. Since Flutter echoes is, relatively speaking, faithful to Chopin’s harmonic and pitch material, and to a proportional representation of Argerich’s rhythmic and dynamic interpretation of that material, one can understand why it barely feels like a work of mine. I have discussed such complexities of authorship in a 2011 article in the Journal of Music Theory entitled “You’re there and you’re not there: Musical Borrowing and Cavell’s ‘Way’”. However, Flutter echoes is a different work from Chopin’s prelude, which is borne out by comparing the two scores and also by comparing the Argerich recording of the Chopin with the Kreutzer’s recording of Flutter echoes. In particular, the interpreter’s relationship to time is very different in each case. In spite of the fact that I do not ask the players to use a click track in this particular work, a steady tempo is desired (again unlike the rest of the Études d’un prélude, save for Chopin desséché). But this steady tempo is not so easily achieved. This is because the events as they occur in my notation sound differently from their placement on the page, or in the metre; this is the case with a great deal of music, both classical and contemporary, but in this case the effect is heightened. In Flutter echoes, the time that one hears (or performs) and the time that one sees (or counts) are different. And it is here that Faulkner’s passage takes on its usefulness. The narrator, Quentin, has ripped the hands off of his watch, which he has in his pocket. Upon seeing a store-front full of other watches, each set to different hours, he thinks: In Flutter echoes, the time that one hears (or performs) and the time that one sees (or counts) are different. I composed Flutter echoes as an early attempt to cope with using micro-measurements as a compositional material. When I completed the piece, I was somewhat aware of the two times it included (notated vs. heard), as well as the multiple eras it referenced (Chopin’s 1839, Argerich’s 1975, my own 2009). It was only when I heard the piece performed, at its première by the Kreutzer Quartet at Wiltons Hall, that I realised how much the Chopin/Argerich time ‘comes to life’. What looks on the page like grid-based, even minimalist music, sounds in time like a supple, breathing body. This is achieved because the grid-based materials (the flutter echoes, the rhythmically-activated melodic lines) are all triggered according to the micro-temporal measurements of a ‘natural event’: Argerich’s expressive and volatile interpretation. Although the composer notes above that Flutter Echoes feels ‘hardly like my work at all’, for the quartet it was Beaudoin’s compositional presence we encountered most immediately on our first play-through - a presence that was paradoxically intensified because the source materials were already known. When Beaudoin first contacted me about the pieces my immediate concern was whether it would permit ‘interpretation’ at all. What role could there be for the performers in this unique context other than to translate the score into sound? Nevertheless, the quartet’s curiosity had been piqued and there was only one way to find out. When we began to rehearse, the most immediately pressing issue was not whether there would be a way of sustaining the architecture over such an extended time scale (which of course was and remains a challenge), but whether the necessary ‘grid’ of bar lines that permits us access to the hyper-detailed transcription of Argerich’s recording would prove an insurmountable obstacle. Whereas Chopin desséché is performed by one person, for whom the ‘inaudible ticking’ of the metre has no physical presence, a quartet has to communicate something to one another in order to stay together. There is thus a palpable tension for the performers in the relationship between the internally communicated (and externally visible) metre, and the directly audible, agogically-shaped structural rubato of the sound itself. One could go as far as to say that, for the performer, Beaudoin’s piece (as distinct from Chopin’s - or Argerich’s) exists principally in this tension. The notation, as the source of this tension, functions dialectically, despite its outwardly traditional appearance. Because the sources are known, the notation of each event conveys both a structural function and a psychological ‘displacement’. The score is thus extremely challenging to realise and we are torn between the competing demands of total synchronisation of the flutter echoes and accurate placement of the initial ictus. A conductor might make this easy, but conducting the ‘hidden pulse’ would also remove the very thing that gives the piece its lifeA conductor might make this easy, but conducting the ‘hidden pulse’ would also remove the very thing that gives the piece its life. Dynamics prove equally challenging, not least because we feel the very long phrases and each tiny variable thus has consequences for the next note (as, for example, at the end of Chopin’s long first phrase, where we fall significantly below the notated dynamic level). In his notes to the players in the score, Beaudoin observes that ‘the bar lines and metre act only as guidelines; they do not indicate any metric structure’. Nevertheless, it is obvious that the placement of events in relation to the bar lines is far from haphazard and in the context of Beaudoin’s necessary devotion to the minute detail of Argerich’s structure it is clear that there has been a complex compositional negotiation between global- and micro-management of the placing of events. At the opening, for example (see Appendix A, bars 1-5), we see that the material has been organised so that the upbeat feeling of the first two melodic notes is maintained and the melodic downbeat of Chopin’s bar 1 has been prioritised over the placement of the accompanying triad - in contradiction to much of the early theory concerning rubato, of which more later. It is easy to imagine a much more provocative and ‘less musical’ relationship between Beaudoin’s metre and the musical events, and in fact the whole piece calls into question his injunction that the bar lines do not indicate any metric structure – or at least draws to attention that the ‘guidelines’ are significant. A similar scenario can be found in Ligeti’s String Quartet No. 2 (1968). In the third movement (Come un meccanismo di precisione) Ligeti appends the instruction “very even, without accentuating the bar subdivisions; nowhere should the impression of a barring be created”. Before even the first note has been played the players are keenly aware that this does not mean the barring is not important as Ligeti notates the extended initial silence as two empty bars (with a metronome indication, and in contradistinction to the ‘ca. 8-10”’ of unmeasured silence at the beginning of the first movement) and the ensemble begins in unison on the second quaver of bar 3. The Kreutzer Quartet’s realisation of this can be seen on the DVD Quartet Choreography (2012). In our first extended conversation Beaudoin was at pains to point out that he did not want merely an ‘accurate realisation’ of his score, but a ‘real performance’ in which it would be accepted that the contingencies of realising the structure would have an impact on the structure itself. We returned to this time and again during preparation for the premiere and in the recording session. As a consequence of the challenges presented by Flutter echoes it would be natural to expect that it would be heavily edited for release (in fact there are six edit points in the finished recording). However, it became clear very early on that recording this music required extreme solutions: either myopic focus on each detail (placing total trust in the inherent continuity of the sources and in Beaudoin’s careful activation of each element), or an attempt to grasp the totality of a structure in which each moment subtly shapes the next. As an ensemble we are not naturally interested in music making of the first sort, which is, of course, not the same as not being concerned with micro-detail. I hope there will be other performances that attempt it. In our live performances and the recording of Flutter echoes there are frequent small - and sometimes not-so-small - imperfections, which because of the unique context of the piece, will actually be perceived as such. The decision to leave these in is thus ethical as much as practical. Some of the key tenets here are of course open to question, but it is interesting to see how long these issues have been a subject of serious debate (the Matthay model of rubato is still taught frequently today, as a useful way of avoiding excess - a necessary fiction). We may want to hold open a much more nuanced view of the specificity of notation, but McEwen’s key point seems to have been central to the way in which Beaudoin has chosen to notate his piece. Perhaps we might suggest that what is most exciting about Argerich is how far she is capable of pushing things without the ‘frame’ disintegrating around her, and how widely varied are her expressive deformations of all of the dimensions in the music. If you speed up the Kreutzer Quartet’s recording of Flutter echoes it is clear that it is a direct analog for Argerich’s - albeit with a starkly different timbre - but it should also be obvious that the generative force is very different. Throughout our performances we are obliged to provide some corporate time feel (communicated almost always by the instruments carrying the flutter echo, in keeping with the ‘old’ notion of rubato described above by McEwen). It is mentally demanding to perform, not only because the placement of events is complex, but also because there is an enormous strain to carry the melodic and harmonic lines over large spans of time, and because almost every sound decays (a mirror for the decay of piano notes in Argerich’s recording). As string players we are thus forced to rely on unusual means of carrying continuity. Beaudoin’s indication of the first part of the piece con sordino with the melody almost exclusively in the cello, and the later sections senza sordino and with the melody predominantly in the first violin provided a broad colour template onto which I think we added everything we could to shape the lines and to provide expressive tension between the melody and flutter echoes. It is not for any of us involved to judge the success - or otherwise - of the enterprise. For me, what remains is a powerfully physical sensation of having been ‘inside’ a series of questions that musicians have been asking for a very long time, but in ways that feel peculiarly to belong to the present. Beaudoin has developed his techniques for using source materials in a wide variety of different ways since writing Flutter echoes, but there are very special challenges and rewards that are only accessible through a piece such as this that holds so closely to its sources. Score excerpts from Étude d’un prélude II - Flutter echoes © 2009 by Richard Beaudoin. Étude d’un prélude I - Chopin desséché, for solo piano (premièred on 8 November 2009, by Marilyn Nonken at CNMAT, University of California, Berkeley, USA; recorded by Mark Knoop and released on the CD: Microtimings, New Focus Recordings, New York, 2012). Étude d’un prélude II - Flutter echoes, for string quartet (premièred on 15 March 2010 by the Kreutzer Quartet at Wiltons Music Hall, London, UK; recorded by the Kreutzer Quartet and released on the CD: Microtimings, New Focus Recordings, New York, 2012). Étude d’un prélude III - Wehmut, text by Heine, for voice and piano (unperformed). Étude d’un prélude IV - Black Wires, for solo piano (premièred on 17 May 2010 by Mark Knoop at Kings Place, London, UK; recorded by Mark Knoop and released on the CD: Microtimings, New Focus Recordings, New York, 2012). Étude d’un prélude V - Photorealism, for orchestra (unperformed). Étude d’un prélude VI - The Real Thing, after Glenn Brown, for string quartet (premièred on 15 March 2010 by the Kreutzer Quartet at Wiltons Music Hall, London, UK; recorded by the Kreutzer Quartet and released on the CD: Microtimings, New Focus Recordings, New York, 2012). Étude d’un prélude VII - Latticed Window, after William Henry Fox Talbot, for solo piano (premièred on 17 May 2010 by Mark Knoop at Kings Place, London, UK; recorded by Mark Knoop and released on the CD: Microtimings, New Focus Recordings, New York, 2012). Étude d’un prélude VIII - Kertész Distortion, after André Kertész, for string quartet (premièred on 15 March 2010 by the Kreutzer Quartet at Wiltons Music Hall, London, UK; recorded by the Kreutzer Quartet and released on the CD: Microtimings, New Focus Recordings, New York, 2012). Étude d’un prélude IX - And they talked about Chopin again, for narrator and piano (premièred on 24 October 2010 by the composer and Constantine Finehouse at Amherst College, USA). Étude d’un prélude X - Second String Quartet, for string quartet (premièred on 30 September 2011 by The Chiara String Quartet, Sanders Theater, Harvard University, USA; recorded by the Kreutzer Quartet and released on the CD: Microtimings, New Focus Recordings, New York, 2012). Étude d’un prélude XI - four28, for solo piano (unperformed; recorded by Mark Knoop and released on the CD: Microtimings, New Focus Recordings, New York, 2012). Étude d’un prélude XII - The After-Image, tableau for two voices and ensemble (commissioned and produced by Boston Lyric Opera, premièred on 1 February 2011 by the Boston Lyric Opera, Boston, USA). Beaudoin, R. (2009) Some Account of the Practice of Microtiming and Musical Photorealism. Preprint (http://dash.harvard.edu/handle/1/3415685?show=full). Beaudoin, R. and Kania, A. (2012) A Musical Photograph? Journal of Aesthetics and Art Criticism, 70(1), pp. 115-127. Beaudoin, R. and Trottier, D. (2012) Conceiving Musical Photorealism: An Interview with Richard Beaudoin. Perspectives of New Music, forthcoming in volume 51, Spring 2013. Faulkner, W. (1952) The Sound and the Fury. New York: Modern Library. Kreutzer Quartet (2012) Quartet Choreography. Divine Art Limited, USA: Métier MSVDX101 [DVD]. Ligeti, G. (1971) Streichquartett No. 2. Mainz: B. Schott’s Söhne. Matthay, T. (1918) Musical Interpretation, Its Laws and Principles, and their Application in Teaching and Performing. Boston: Stanhope Press. McEwen, J.B. (1928) Tempo Rubato or Time Variation in Musical Performance. London: Oxford University Press. Senn, O., Kilchmann, R. and Camp, M-A. (2009) ‘Expressive timing - Martha Argerich plays Chopin’s Prelude Op. 28 no. 4 in E minor’. In: Buck, R., Pretty, S. and Williamon, A . (eds.) Proceedings of the International Symposium on Performance Science 2009. Utrecht: European Association of Conservatoires, pp. 107-112. Schenker, H. (1996) The Masterwork in Music, Vol. 2. ed. William Drabkin, trans. Ian Bent, William Drabkin, John Rothgeb and Hedi Siegel, Cambridge: Cambridge University Press. [orig. pub. (Ger.) 1926]. Webern, A. (1924) Sechs Bagatellen für Streichquartett Op. 9. Vienna: Universal Edition. Richard Heyde is a composer working in America whose recent works pioneer a compositional technique involving micro-temporal measurements of recorded performances. He has received commissions from the Konzerthaus Dortmund, Staatstheater Kassel, Boston Lyric Opera, and the President of Harvard University. He has written works for Mark Knoop, Marilyn Nonken, Wolfram Rieger, Carl Rosman, Serge Vuille, Clive Driskill-Smith, the Chiara String Quartet, the Kreutzer Quartet and Sound Icon. His cycle on texts by Christa Wolf, Nach-Fragen, was sung across Europe by the renowned German soprano Annette Dasch, including at the Amsterdam Concertgebouw, Wiener Konzerthaus, Hamburg's Laeiszhalle, Linz’s Brucknerhaus, and the Schwetzinger SWR Festspiele. His writings on music have been published in the Journal of Aesthetics and Art Criticism, Perspectives of New Music and The Journal of Music Theory. He holds the post of Preceptor on Music in the Faculty of Music at Harvard University. Neil Heyde is the cellist of the Kreutzer Quartet and Head of Postgraduate Programmes at Royal Academy of Music. His research focuses on the interfaces between performance, composition and analysis. As a soloist and chamber musician he has appeared throughout Europe, broadcasting for the BBC, WDR, ORF, Radio France, Netherlands Radio and many other networks. New music is central to his work but he is also dedicated to performing and recording neglected areas of the repertoire. Important projects have been Ferneyhough’s Time and Motion Study II for solo cello and electronics (1973–76) and first recordings of the complete quartets of Michael Finnissy, Roberto Gerhard, David Matthews (ongoing) and Anton Reicha (ongoing). He has edited a series of critical editions for Faber Music. He has supervised numerous doctoral students to completion and currently has students working on Bartók, Piatti, Stokowski, and on developing innovative combinations of theatre and musical performance. In September 2013 Neil was appointed as a Professor of the University of London at the Royal Academy of Music.